Last month I briefly introduced you to Simple Loose Leaf, a monthly subscription box for tea drinkers. I told you that I'd be back with a review once I had the chance to try it out, so as promised - here is that review. 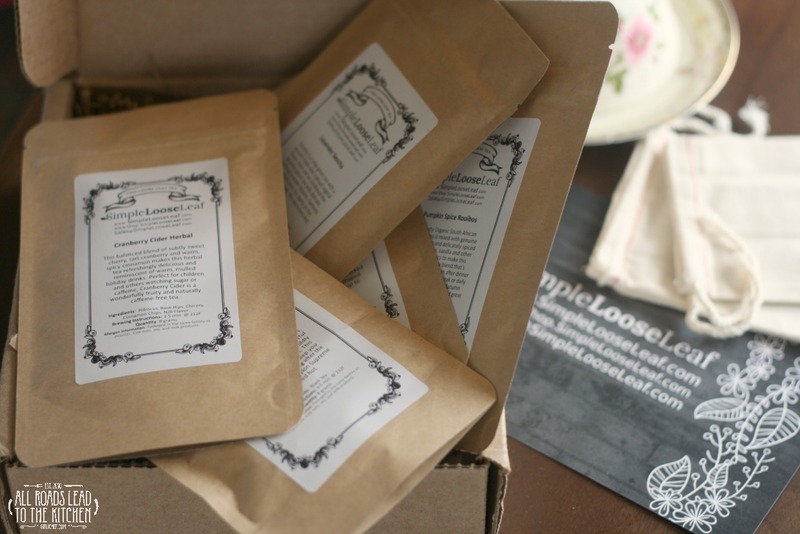 With a Simple Loose Leaf membership, each tea box that you receive will include at least 4 different loose leaf teas - a black, a green, an herbal, and a surprise or two, plus 2 reusable muslin tea bags. Each box also contains a beautifully done card with information about the products in your box. 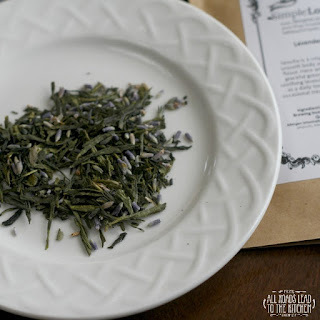 Along with descriptions of each type of tea that you received, it also tells the proper steps for making a cup of loose leaf tea, which I think is important, especially for those less familiar with loose leaf...like myself. Knowing how much of each tea to use, what temperature the water should be (because it's not the same for all types), and how long to let it steep can be a bit daunting if you've only ever used prefilled tea bags. Each card also contains a Member Discount Code specific to your tea box that gives you a 50% discount on any tea purchase at their shop website through the end of that month. The package is sleek and packed nicely, with each tea arriving in its own resealable pouch with description, ingredients, quantity, and brewing instructions on the front. Below are the types of tea that were included in the January 2016 box. 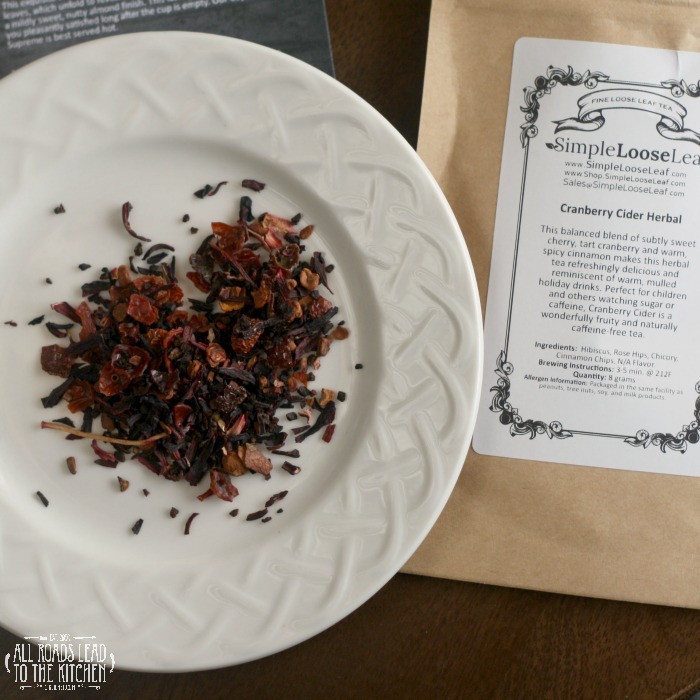 Cranberry Cider Herbal: A balanced blend of subtly sweet cherry, tart cranberry, and warm, spicy cinnamon makes this herbal tea refreshingly delicious and reminiscent of warm, mulled holiday drinks. Perfect for children and others watching caffeine. Fruity and naturally caffeine-free. my thoughts: The smell of this one is amazing, and it really does conjure up a sense of the holidays, though I'd happily enjoy it year round. Plus, it's so pretty! Lavender Sencha Green: Sencha is a crisp green tea with a smooth body and a proud vegetal flavor. Here, it's combined with delicate, soothing lavender blooms. Fantastic as a daily tonic for clarity or the occasional treat, this tea is best hot. my thoughts: I'm a sucker for lavender, it really is the perfect soother. The green tea is smooth and light, and the addition of the lavender buds makes this feel like a spa drink. 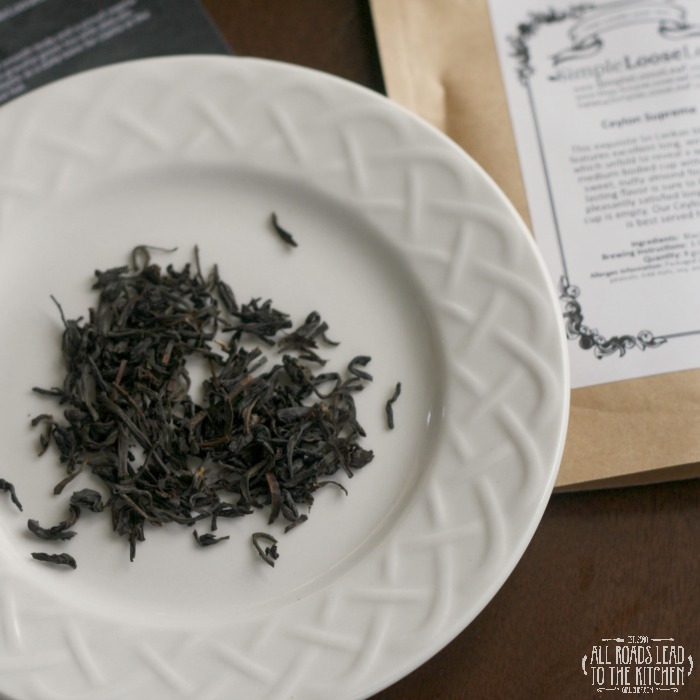 Ceylon Supreme: This exquisite Sri Lankan black tea features excellent long, wiry leaves, which unfold to reveal a medium-bodied cup with a mildly sweet, nutty almond finish. Lasting flavor that will keep you satisfied after your cup is empty. Best served hot. My thoughts: This is a perfect, all-occasion black tea. It smells lovely and is nice with milk and honey. I used it to plump raisins for a loaf of Irish Barmbrack recently, and imparted a beautiful flavor to the bread. 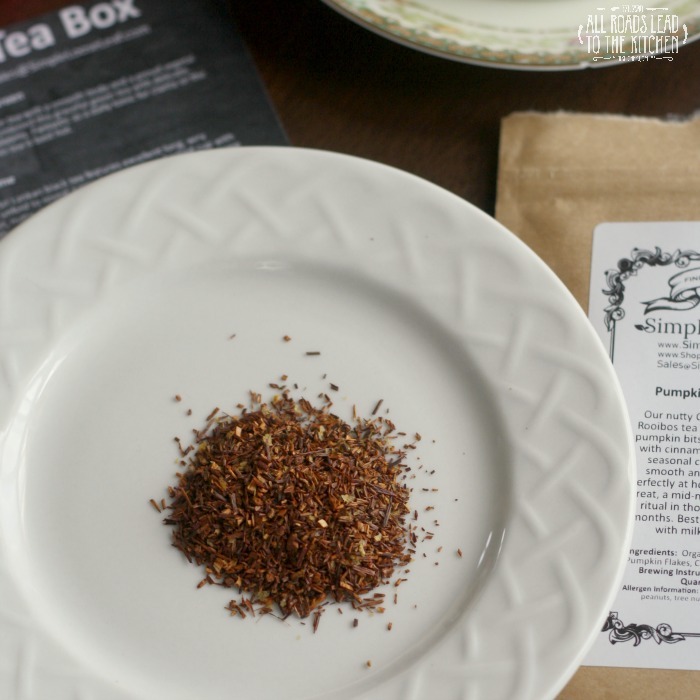 Pumpkin Spice Rooibos: Nutty Organc South African Rooibos tea mixed with pumpkin bits and delicately spiced wtih cinnamon, vanilla, and other seasonal classics. This smooth and tasty blend is perfectly at home as an after dinner treat, a mid-morning break, or a daily ritual in those blustery Autumn months. Best served hot and great with milk and sweetener. my thoughts: I love this, the smell alone is enough to transport lovers of fall (like myself) to paradise. I like it with milk and honey and do think it's best enjoyed on a crisp autumn day. Bird Nest Pu'er: Pu'er is a tea famed in China for its earthy flavor ad dark color. 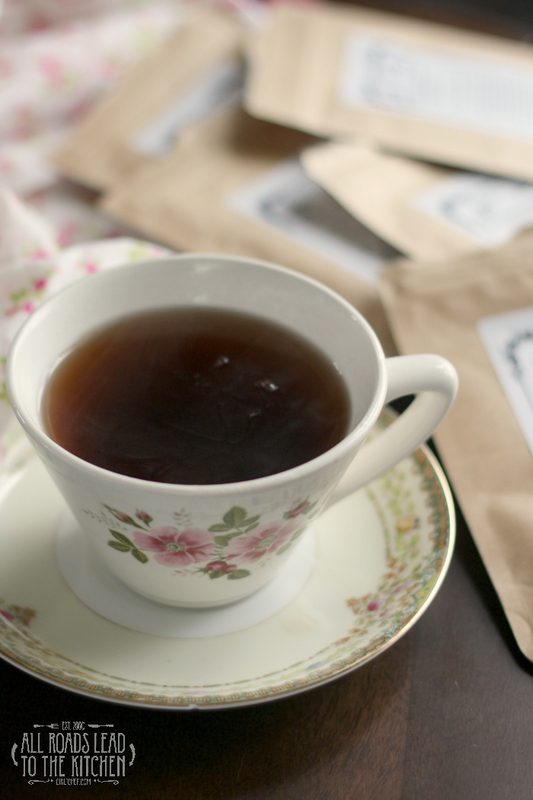 This tea is fermented and then pressed into cakes of various sizes. Believed to have slimming effects, this tea is a great start to a busy morning and great on the run as it requires no milk or sugar. Each serving is packed individually in neat nest-shaped cakes and can be brewed up to 3 times. my thoughts: I really wanted to enjoy this, but the smell is awful (and since smell influences taste, it's very hard to drink). I think it smells sort of like a dirty fish tank or maybe even a wet bird's nest (go figure). It must be an acquired taste. The sips I managed to take without breathing first were very smooth, but...this one is not for me. Overall, I think this is a fantastic subscription box - both for those who are already tea lovers and those who would like to delve further into the world of tea. I enjoyed 4 out of 5 teas included in this box, and even though I didn't like it, am happy that I was able to try Pu'er...it will make a great conversation topic one of these days. Will I continue this subscription (aka pay for it when my free trial period is over): YES! Want to subscribe? Join now. Need more information? 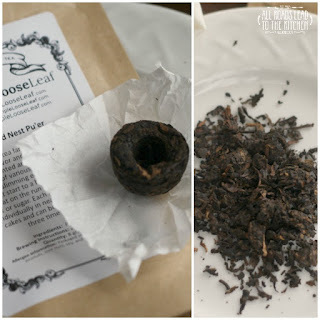 Check out the FAQ's at the Simple Loose Leaf website. Memberships are available in 1 month ($13.99/month), 3 month ($12.99/month), and 6 month ($11.99/month) subscriptions. You can get your first month for $3.99 if you sign up now! 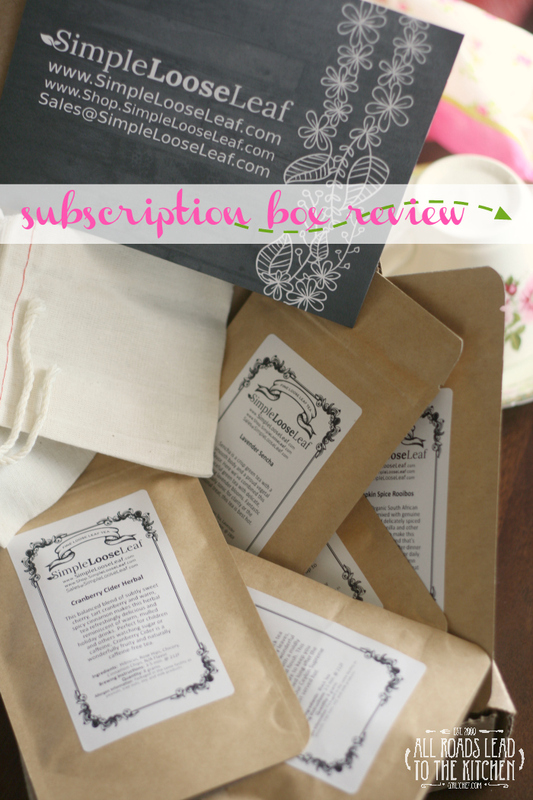 As a US Family Guide blogger, I received a complimentary tea box for the purposes of review. All opinions stated in this post are my own.